Since late in 2013 data on bank lending at the postcode sector level for Great Britain has been available via the Council of Mortgage Lenders (mortgages) and the British Bankers' Association (personal loans). This followed an announcement in July 2013 that such data would be made available in order to - among other things - "boost competition" and "identify where action is required to help boost access to finance". It was also said at the time that the data would be "a major step forward in transparency on bank lending". My assessment is that this is only partly true. The new data do represent a major step forward and organisations such as the CML are to be commended for their work on this, but in relation to mortgage lending at least things are more opaque than transparent, as I attempt to explain below. So, in the image above, which shows lending location quotients for HSBC in Merseyside, there is no way of knowing whether areas of lower lending receive less finance because fewer people there apply for mortgages or whether some other supply-side mechanism is in force (e.g. bank lending policy). All we can really do is compare the lending practices of different institutions and note the differences. The same type of map is shown below for Lloyds banking group (the UK's biggest lender). This would appear to suggest some significant differences in relation to where these two banks lend the most. 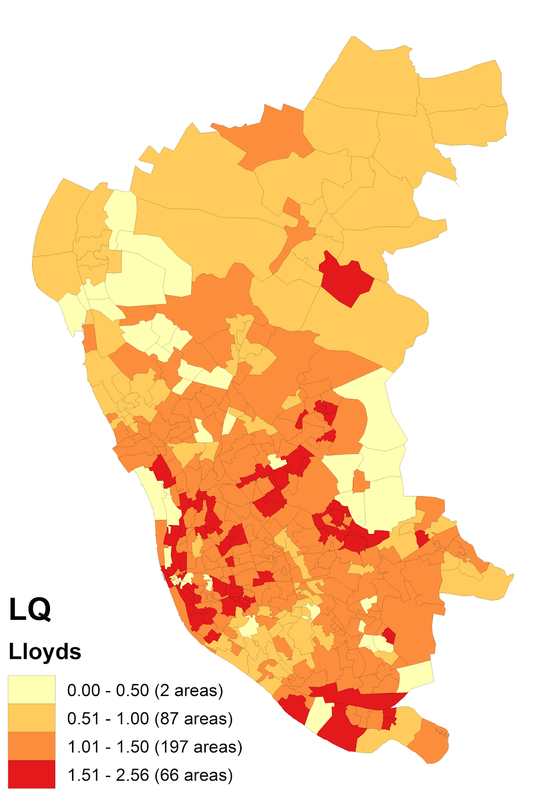 People with a knowledge of Merseyside will recognise that Lloyds has many higher lending location quotients in poorer areas. Is this 'evidence' of financial exclusion, redlining, sub-prime lending? No, it definitely is not. It does show, however, that banks lend differently at the local level. This is not news, but the new data releases allow us to identify very local patterns and ask questions about it. "Unsurprisingly, with data covering outstanding lending rather than new flows, there are only small changes since the last quarter. It is likely to take some time before any discernable changes or trends emerge from this quarterly data series." Without some additional contextual information - as is available in the United States under the provisions of the HMDA, we can only really guess at the causes of such change. That's why various organisations have been campaigning for greater financial transparency for some time - most notably Friends Provident in their report from 2012. I've done a reasonable amount of analysis with the new mortgage lending data, including writing and submitting an academic paper, a series of maps and various other bits and bobs via twitter. My assessment closely mirrors that of Owen Boswarva, who notes the 'open-ish' nature of the data releases. The data do not, as far as I can see, come with any kind of licence (such as the Open Government Licence) but I and many others have just taken for granted that the data are 'open'. Barclays - if you go to the postcode sector data page on the CML website, there are links to data for all banks. When you click on 'Barclays' it will take you to their 'Citizenship' pages (as of 8 April 2014). From there you can link to the new Q3 2013 data release within a news article. It's not the easiest of journeys and could be made much more obvious. The file itself is, rather strangely, called 'Satellite.xlsx'. I think they could do better. Clydesdale & Yorkshire Banks - these institutions are part of the same banking group and so report together as one. The data are pretty easy to find. HSBC - for me, this is the most troublesome data release since I can only find it in PDF. It's not a massive task to convert it into a usable format, but it seems really odd in this day and age that a major financial institution would choose to release 10,000 rows of data in PDFs. If anyone has spotted another format please get in touch. The HSBC approach is at odds with the spirit of the exercise, surely. Lloyds - the UK's biggest lender (following a series of acquisitions) also have a nice data page, which is easy to navigate. They provide some useful information, such as the fact that most buy-to-let mortgages are included in the data, and a direct link to the Excel spreadsheet. Nationwide - my analysis suggests that Nationwide (the only building society to release data) truly live up to their name in terms of the the geography of their lending. Their data page is basic but it does the job. Santander - this institution also provides clear and simple access to their lending data. This is now different from the link provided on the CML website. RBS - as far as I can tell, RBS are the only bank to have produced their own maps of lending patterns across Great Britain and their data page is really quite good. The new data are currently provided via a news page link. Despite the fact that some of the data are a little hard to find, it's mostly quite a good situation - apart from the HSBC PDFs of course. It would be much better if all the data were put together in a single spreadsheet by the CML but perhaps this is something the individual lenders are not too keen on (!) so it's up to people like me to stitch it all together. In which case, it would be great if HSBC started publishing in a more convenient format. We need some indication of demand - e.g. number of applications, number of refusals, and so on. We can't do research into subjects like 'redlining' because we don't have the above information. We can make comparisons between banks in poorer areas but that's about it for now. If we really want to look at transparency, we need more information. We need more of a breakdown of the data in each new release to say how much is new lending and how much of the change is down to other factors - particularly so at the postcode sector level. Some additional clarity on the 'open' nature of the data would be very welcome. We need more banks to follow the example of the first seven and make their data available. With more than 100 lenders in the market it's probably not possible to get all to comply, but more work here would be useful. All of the above represents really positive progress, but I think more is needed. I do realise of course that the CML are "considering additional features and functionality for future reporting waves", so I look forward to seeing what happens next.